An estimated 6.3 million children under 15 years of age died in 2017, or 1 every 5 seconds, mostly of preventable causes, according to new mortality estimates released by WHO, UNICEF, the United Nations Population Division and the World Bank Group. Main causes identified include lack of access to water, sanitation, proper nutrition or basic health services. 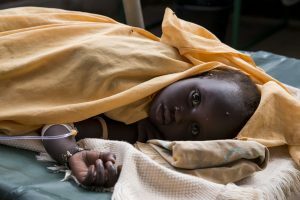 Most children under 5 die due to preventable or treatable causes such as complications during birth, pneumonia, diarrhea, neonatal sepsis, and malaria. By comparison, among children between 5 and 14 years of age, injuries become a more prominent cause of death, especially from drowning and road traffic, with the risk of dying for a child from sub-Saharan Africa 15 times higher than in Europe. Disparities also exist within countries. Under 5 mortality rates among children in rural areas are, on average, 50% higher than among children in urban areas. In addition, those born to uneducated mothers are more than twice as likely to die before turning 5 than those born to mothers with a secondary or higher education. Despite these challenges considerable progress has been made. The number of children dying under 5 has fallen dramatically from 12.6 million in 1990 to 5.4 million in 2017. The number of deaths in older children aged between 5 to 14 years dropped from 1.7 million to under a million in the same period.